Many artifacts are woven for use in tents, huts and dwellings. Among the most numerous are rectangular weavings which are folded in half and stitched and then become cushions and pillows. A small opening is left on a long side sufficient for various fillings to be inserted by hand. Bags of all sizes range from the tiny which contain precious items of jewellery, spices or dried fruit to the huge which are filled with grain. Saddle bags for transport of goods by horse or donkey are common. 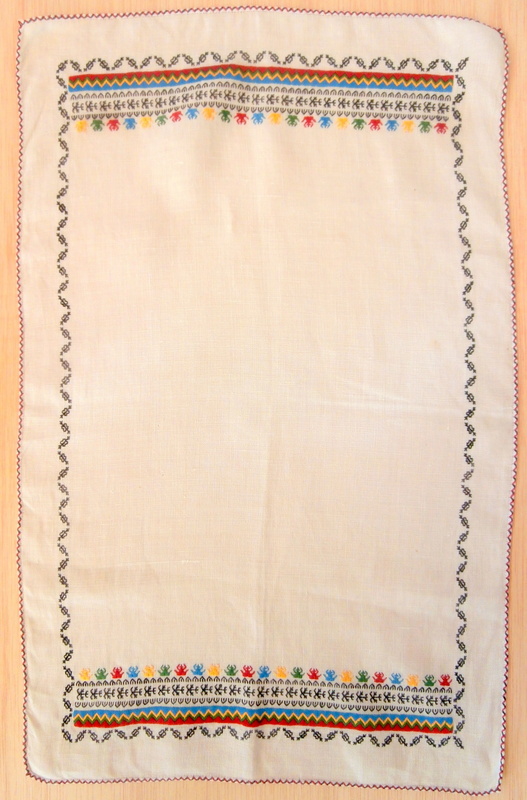 Finely woven bags are still made as dowry pieces. Many items of clothing are woven for both every day, ceremonies and special occasions. 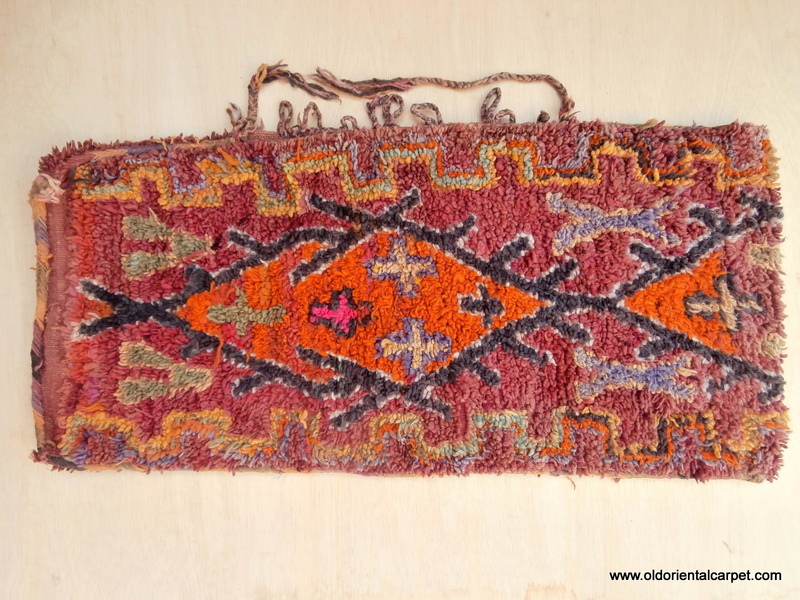 ANATOLIAN SADDLE BAG A rare semi-antique shepherd's bag from the region of Fetiyhe in south west Turkey. The long opening in the centre allows for the shepherd's head to go through and the bags hang on his front and back. The black and white photo shows a similar piece worn by a rural shepherd. This region in Ottoman Empire times was known as "Megri" but the name was changed around 1920. The intense shades of indigo, madder and mustard yellow are only found in this region and it is therefore probable they are natural dyes and sourced from nearby plants. It is in impeccable condition complete with the original small loops at each corner which allows it to be fastened to the body when worn. Reference 285. Size 131 x 47cms. 4ft. 4ins. x 1ft. 7ins.. Euros 450. ANATOLIAN SADDLE BAG A rare semi-antique shepherd's bag from the region of Fetiyhe in south west Turkey. The long opening in the centre allows for the shepherd's head to go through and the bags hang on his front and back. 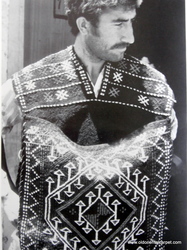 The black and white photo shows a similar piece worn by a rural shepherd. This region in Ottoman Empire times was known as "Megri" but the name was changed around 1920. 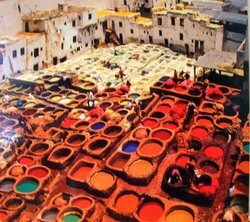 The intense shades of indigo, madder and mustard yellow are only found in this region and it is therefore probable they are natural dyes and sourced from nearby plants. It is in impeccable condition complete with the original small loops at each corner which allows it to be fastened to the body when worn. Reference 285. Size 131 x 47cms. 4ft. 4ins. x 1ft. 7ins. SHEPHERD WITH BAG. SPECIAL OFFER............MOROCCAN BERBER HEAD DRESS which is for a young girl and is called "Bonnet d`enfant". These precious pieces form part of the dress for ceremonial occasions and this one originates from Berbers in the High Atlas mountain region of Ait Ouaouzguite, south of Marrakech. Similar pieces can be seen in "Splendeurs du Maroc", plate 278, page 208, and "Taznacht" plate 65, page 77. Reference 2692, size 41 x 21 cms., or 16 ins x 9 ins. Euros 65. 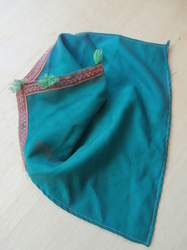 MOROCCAN BERBER HEAD DRESS which is for a young girl and is called "Bonnet d`enfant". These precious pieces form part of the dress for ceremonial occasions and this one originates from Berbers in the High Atlas mountain region of Ait Ouaouzguite, south of Marrakech. Similar pieces can be seen in "Splendeurs du Maroc", plate 278, page 208, and "Taznacht" plate 65, page 77. Reference 2692, size 41 x 21 cms., or 16 ins. x 9 ins. CLOSE UP. MOROCCAN BERBER HIGH ATLAS TENT BAG. 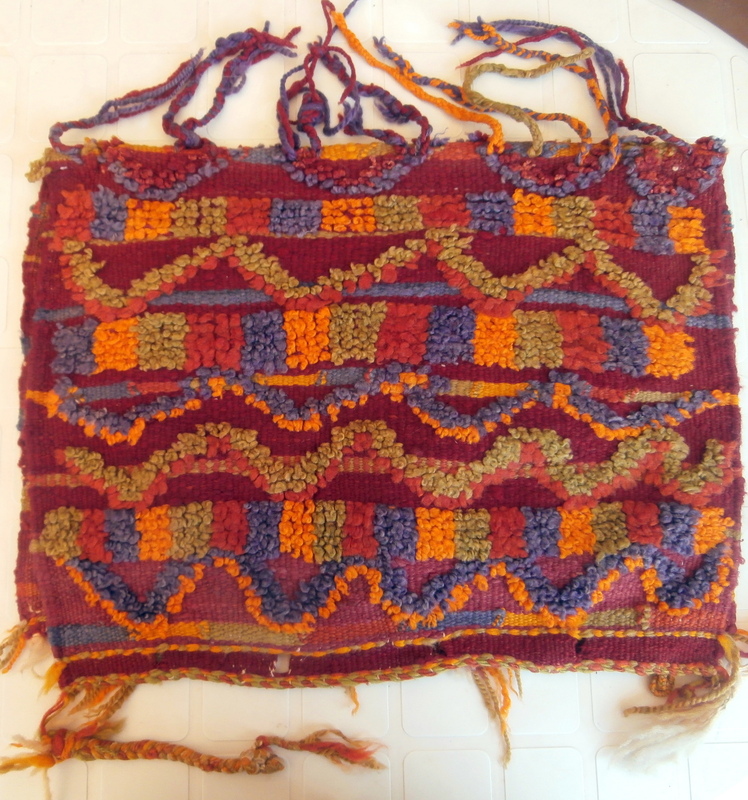 Known as "aalau" which is a squarish, partly piled bag usually woven by Berber women of the Ait Bou Ichaouen in the eastern High Atlas. 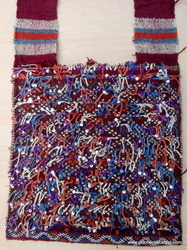 The bag is given to a daughter prior to marriage and is subsequently used to contain either jewellery or clothing or sometimes ready-spun wool. It is fastened at the top by hand plaited rope which passes through a line of slits. This piece has been opened out and when in use would be folded in half and both sides joined together. The tassels at the midway stage would then hang down. The top row consists of an interesting design of 5 Berber tents. 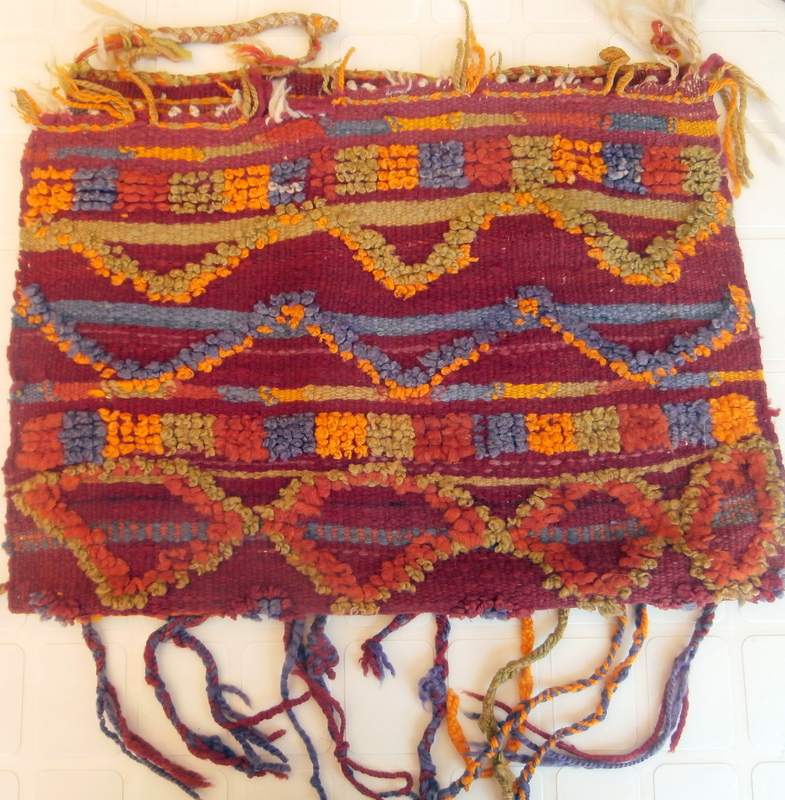 Weaving of this type is well described in "Ait Bou Ichaouen-Weaving of a Nomadic Berber Tribe" by Alfred and Suzanne Saulniers. It is a fascinating and collectable piece. Reference 2620. Size opened out 84 x 56cms. 2ft.9in. x 1ft.10in. Euros 170. MOROCCAN BERBER HIGH ATLAS TENT BAG. 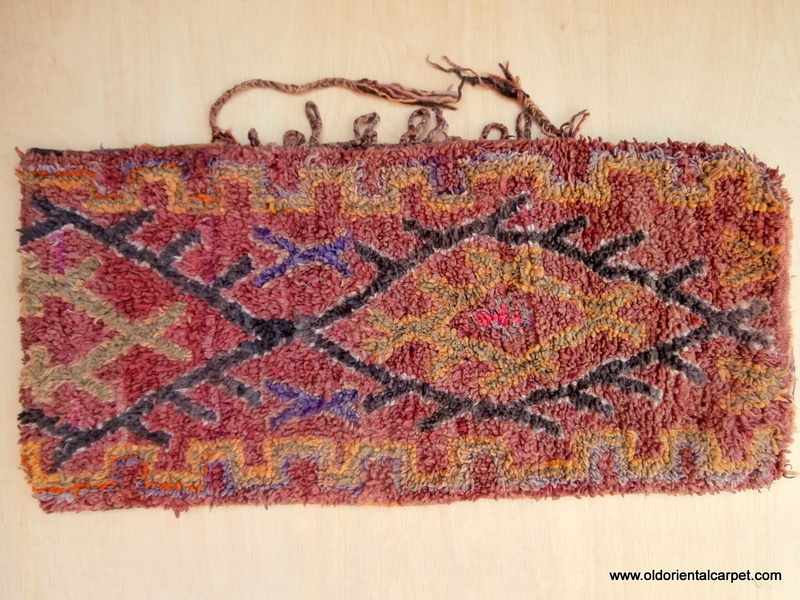 Known as "aalau" which is a squarish, partly piled bag usually woven by Berber women of the Ait Bou Ichaouen in the eastern High Atlas. 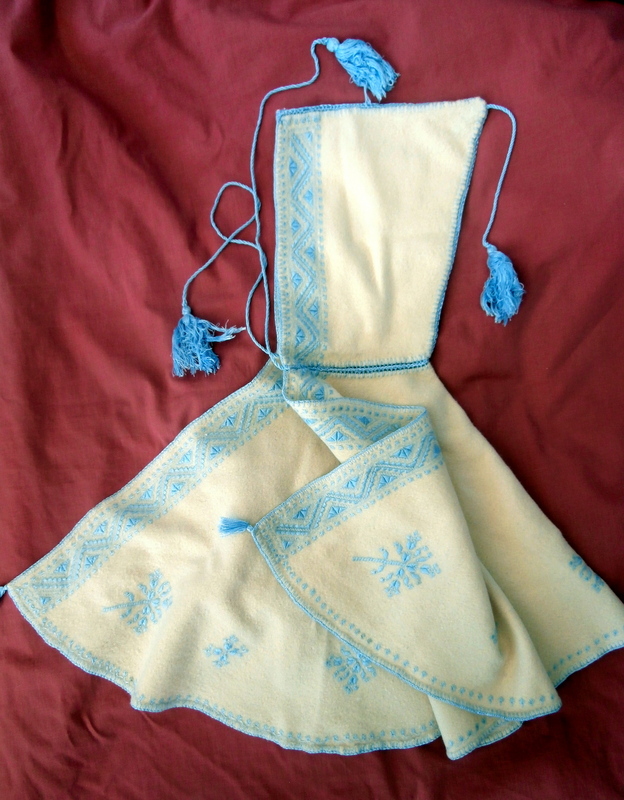 The bag is given to a daughter prior to marriage and is subsequently used to contain either jewellery or clothing or sometimes ready-spun wool. It is fastened at the top by hand plaited rope which passes through a line of slits. This piece has been opened out and when in use would be folded in half and both sides joined together. The tassels at the midway stage would then hang down. The top row consists of an interesting design of 5 Berber tents. 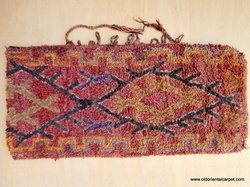 Weaving of this type is well described in "Ait Bou Ichaouen-Weaving of a Nomadic Berber Tribe" by Alfred and Suzanne Saulniers. It is a fascinating and collectable piece. Reference 2620. Size opened out 84 x 56cms. 2ft.9in. x 1ft.10in. REVERSE. 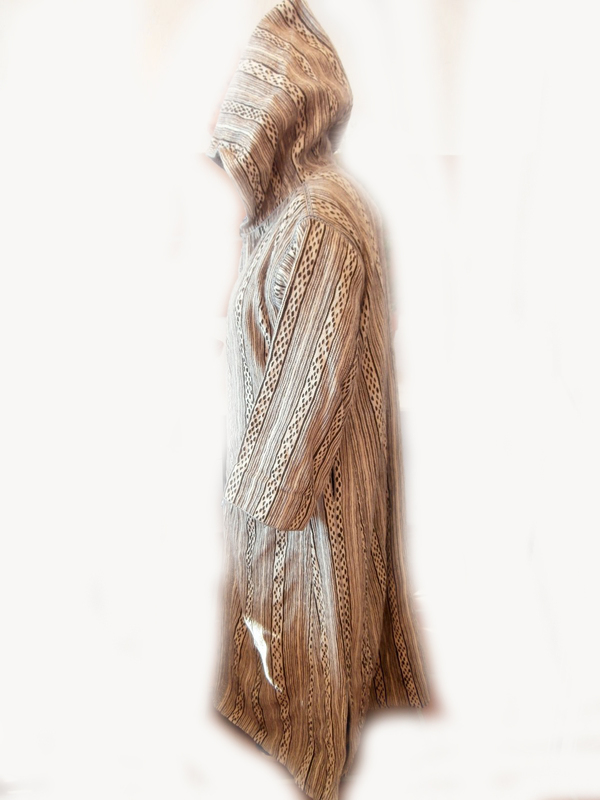 SPECIAL OFFER.............MOROCCAN BERBER MAN'S CAPE. Hand woven from undyed, hand spun wool. This is the work of Berbers in the region of Marmoucher in the Middle Atlas mountains and would have been used by a Berber man, probably a shepherd, for protection against the biting winter cold. These capes are known as "jilaba" and there is good information with colour photos in "Splendeurs du Maroc" pages 155 and 197 and also "North African Textiles" on page 86. This example has very fine and detailed design incorporated in the weave. Reference 2605. Size 160cms. high x 95cms. opened at bottom. 5ft.8in. x 3ft.2in. Euros 190. MOROCCAN BERBER MAN'S CAPE. Hand woven from undyed, hand spun wool. This is the work of Berbers in the region of Marmoucher in the Middle Atlas mountains and would have been used by a Berber man, probably a shepherd, for protection against the biting winter cold. 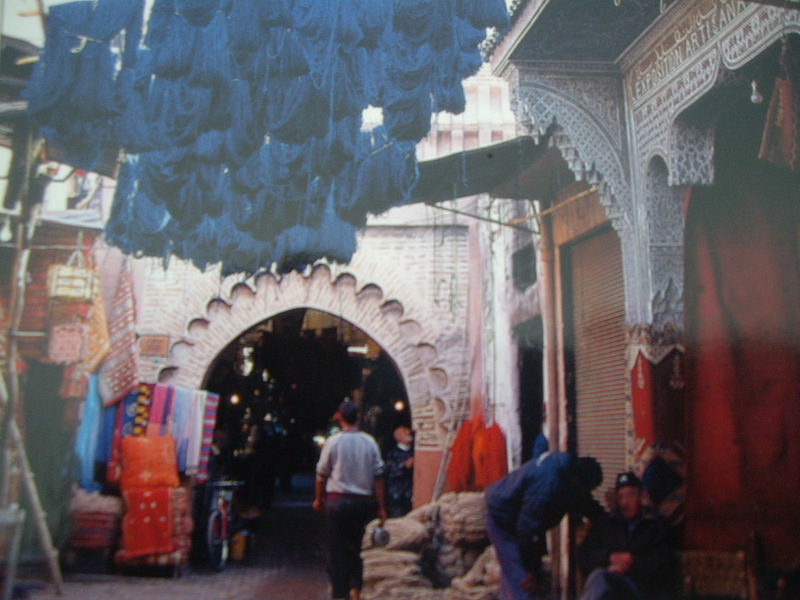 These capes are known as "jilaba" and there is good information with colour photos in "Splendeurs du Maroc" pages 155 and 197 and also "North African Textiles" on page 86. This example has very fine and detailed design incorporated in the weave. Reference 2605. Size 160cms. high x 95cms. opened at bottom. 5ft.8in. x 3ft.2in. 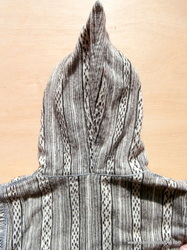 DETAIL OF HOOD. MOROCCAN BERBER HIGH ATLAS BAG. Sometimes these bags, known as "aalau" are woven in pairs and used as a gift from the bride's mother to her daughter and son-in-law. It is the work of the Ait Bou Ichaouen Berbers of the far east High Atlas. It is old and in great condition with original tassels, overcasting and handle. It was probably subsequently used to store jewellery and precious items. 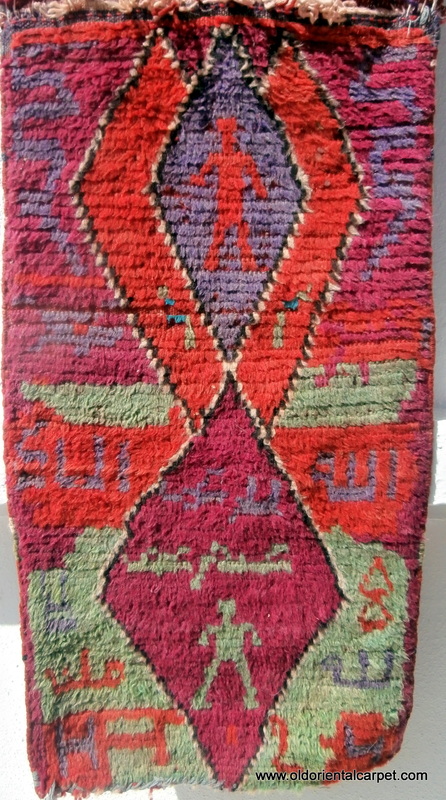 The design is of repeated Berber fertility symbols. Reference 2646. Size 37 x 36cms. 1ft.2in.square. Euros 67. MOROCCAN BERBER HIGH ATLAS BAG. Sometimes these bags, known as "aalau" are woven in pairs and used as a gift from the bride's mother to her daughter and son-in-law. 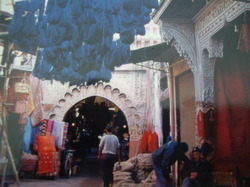 It is the work of the Ait Bou Ichaouen Berbers of the far east High Atlas. It is old and in great condition with original tassels, overcasting and handle. It was probably subsequently used to store jewellery and precious items. 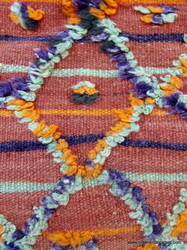 The design is of repeated Berber fertility symbols. Reference 2646. Size 37 x 36cms. 1ft.2in.square. CLOSE UP. BALOUCH / BELOUCH BAG FACES. 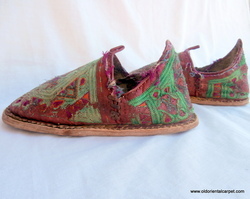 A rare pair from the region of Firdous which lies in the desert region of Khorrasan in north east Persia. Saddle bags from this Belouch group are particularly rare. 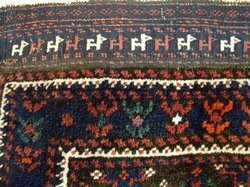 The kilim borders with embroidered designs of rows of goats are most unusual and I know of only one other piece with this feature which was shown in HALI Edition 94 on page 122. The wools are soft and lustrous. Reference 292A and 292B. Size 71 x 73cms. each. 2ft.4in. x 2ft.5in. each. Euros 595 the pair. BALOUCH / BELOUCH BAG FACES. 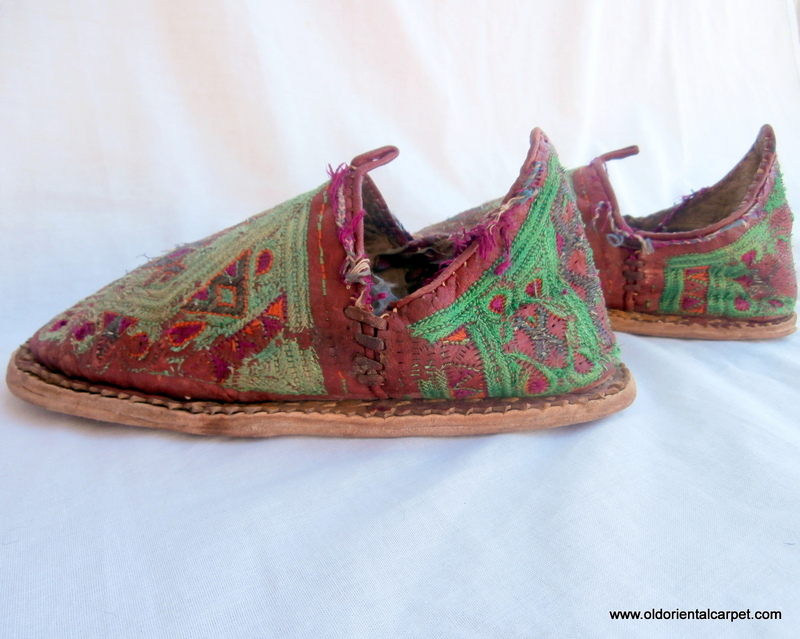 A rare pair from the region of Firdous which lies in the desert region of Khorrasan in north east Persia. Saddle bags from this Belouch group are particularly rare. 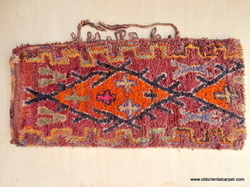 The kilim borders with embroidered designs of rows of goats are most unusual and I know of only one other piece with this feature which was shown in HALI Edition 94 on page 122. The wools are soft and lustrous. Reference 292A and 292B. Size 71 x 73cms. each. 2ft.4in. x 2ft.5in. each. Euros 595 the pair. CLOSE UP showing row of goats which each bag has in the top kilim border. RARE MOROCCAN BERBER SHOES dating from the first half of the 20th century and which are hand made from camel leather. The embroidery is hand stitched silk. They would have been used for ceremonial or important occasions. They were not for daily wear. They are from a Berber group in the Djebel Siroua region of the High Atlas pre-Sahara in southern Morocco. Two similar pairs can be seen in "Spendeurs of Maroc" published by Musee Royal de l'Afrique Centrale as plates 247 and 248 which are part of a private collection of rare Berber artifacts. Reference 2578. Size 25cms.10ins. long. Euros 265. 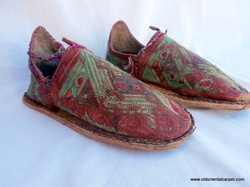 RARE MOROCCAN BERBER SHOES dating from the first half of the 20th century and which are hand made from camel leather. The embroidery is hand stitched silk. They would have been used for ceremonial or important occasions. They were not for daily wear. They are from a Berber group in the Djebel Siroua region of the High Atlas pre-Sahara in southern Morocco. Two similar pairs can be seen in "Spendeurs of Maroc" published by Musee Royal de l'Afrique Centrale as plates 247 and 248 which are part of a private collection of rare Berber artifacts. MOROCCAN BERBER HOOD. The small size of the portion to cover the head, together with the delicate embroidered designs, suggest that the is a "Bonnet d�Enfant" for a young girl. The material is cream colored felt with designs and original tassels for fastening in fine cotton. It is quite old but in unblemished condition and may have been kept for ceremonial or special occasion use. Reference 2813. Size 62 x 60 cms., or 24 x 22 ins. Euros 58. 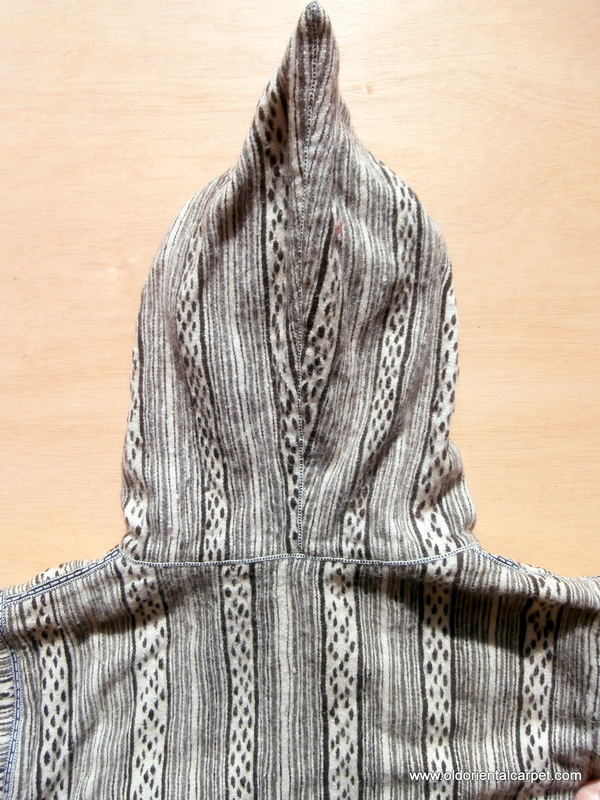 MOROCCAN BERBER HOOD. 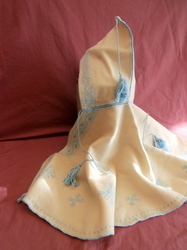 The small size of the portion to cover the head, together with the delicate embroidered designs, suggest that the is a "Bonnet d�Enfant" for a young girl. The material is cream colored felt with designs and original tassels for fastening in fine cotton. It is quite old but in unblemished condition and may have been kept for ceremonial or special occasion use. Reference 2813. Size 62 x 60 cms., or 24 x 22 ins. SIDE VIEW. MOROCCAN BERBER HIGH ATLAS BAG / PILLOW from the Berber group Ait Sergrouchan in the eastern High Atlas mountains close to the Algerian border. 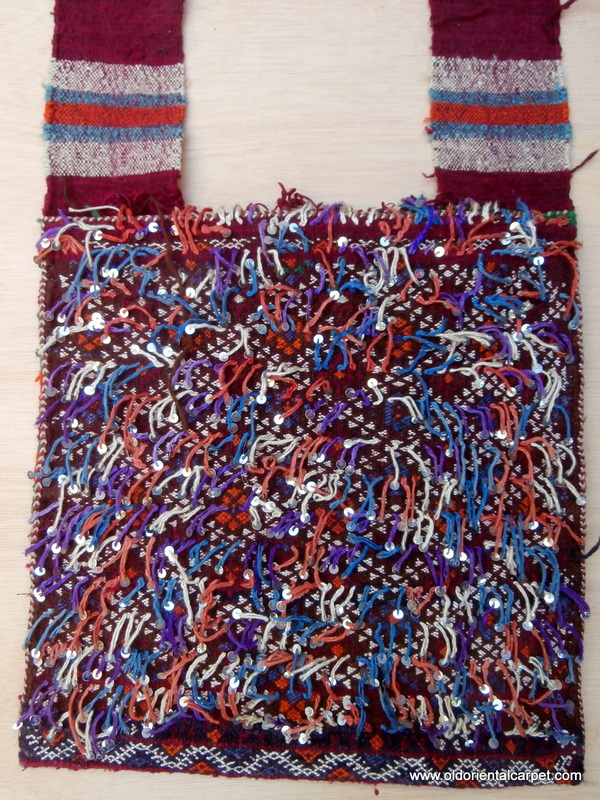 This is a very old piece with fine embroidered design embellished with many metal sequins. 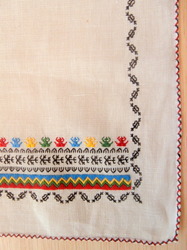 Very fine white cotton has been used for emphasis. This work is very little known but there is a piled rug from this tribe which has some elements of these designs and which is shown as Plate 34 in "Maroc - Tapis de Tribus". Reference 2641. Size 66 x 30cms. 2ft.2in. x 1ft. Euros 105. MOROCCAN BERBER HIGH ATLAS BAG / PILLOW from the Berber group Ait Sergrouchan in the eastern High Atlas mountains close to the Algerian border. This is a very old piece with fine embroidered design embellished with many metal sequins. 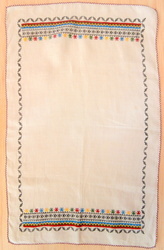 Very fine white cotton has been used for emphasis. This work is very little known but there is a piled rug from this tribe which has some elements of these designs and which is shown as Plate 34 in "Maroc - Tapis de Tribus". Reference 2641. Size 66 x 30cms. 2ft.2in. x 1ft. REVERSE. MOROCCAN BERBER MIDDLE ATLAS SADDLE BAG which is a very rare example from the Berber tribe Beni M'guild. The deep purple used for the foundation kilim and which is plied together with deep indigo for the original fastening ropes is often used in the tribe's piled carpets. 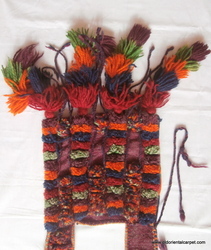 The bag faces are embellished with multi-coloured woollen decorations and the same wools have been used for the extensive tassel work. A spontaneous and unique tribal artifact. Reference 2642. Size 100 x 37cms. 3ft.3in. x 1ft.3in. without tassels. Euros 365. MOROCCAN BERBER MIDDLE ATLAS SADDLE BAG which is a very rare example from the Berber tribe Beni M'guild. The deep purple used for the foundation kilim and which is plied together with deep indigo for the original fastening ropes is often used in the tribe's piled carpets. 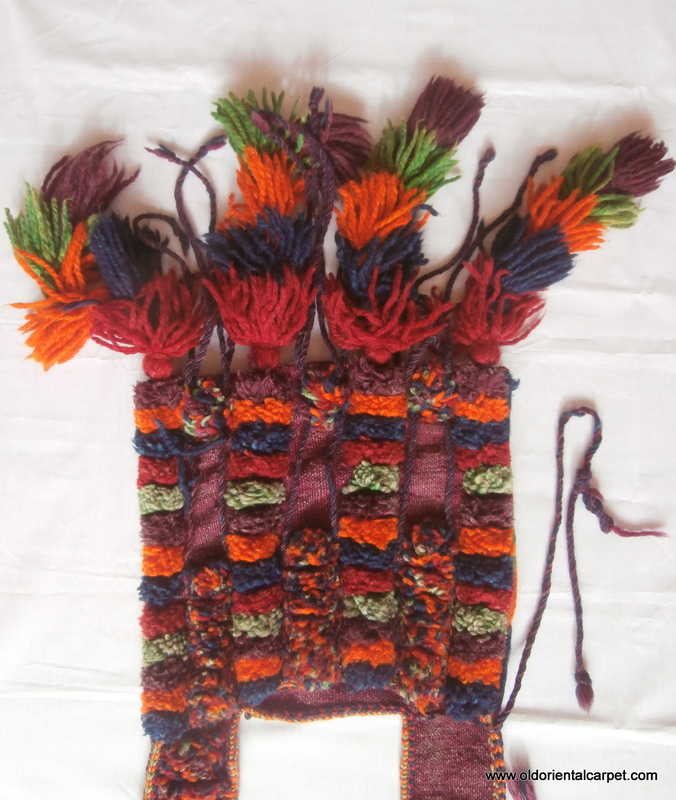 The bag faces are embellished with multi-coloured woollen decorations and the same wools have been used for the extensive tassel work. A spontaneous and unique tribal artifact. Reference 2642. Size 100 x 37cms. 3ft.3in. x 1ft.3in. without tassels. CLOSE UP. 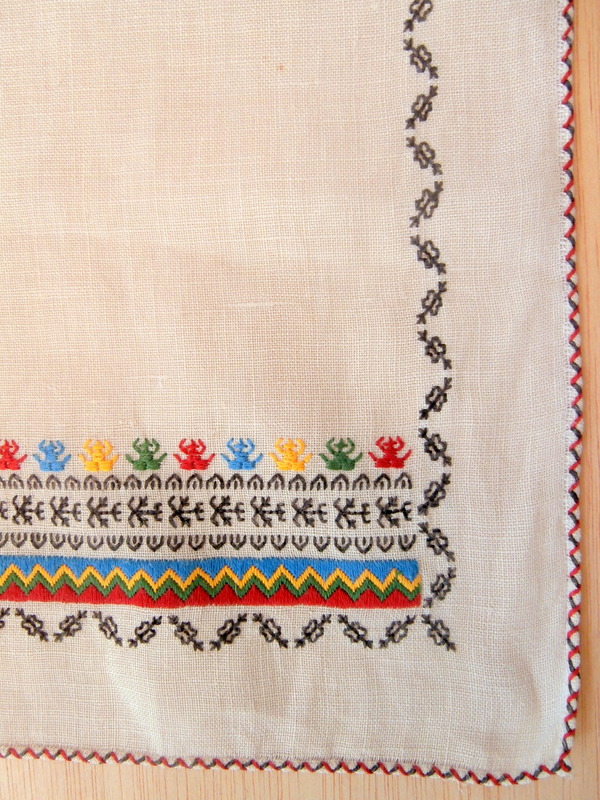 TUNISIAN BERBER EMBROIDERY which is small, very finely stitched and would have been used as a tray cover. The inner rows of flowers are depictions of long petalled tulips which have been borrowed from Ottoman designs. The background is very fine white linen. Reference 2815. Size 33 x 50 cms., or 13 x 20 ins. Euros 35. TUNISIAN BERBER EMBROIDERY which is small, very finely stitched and would have been used as a tray cover. The inner rows of flowers are depictions of long petalled tulips which have been borrowed from Ottoman designs. The background is very fine white linen. Reference 2815. CLOSE UP. BERBER HIGH ATLAS TENT BAG which is the very fine work of the little known Ait bou Ichaouen Berbers in the eastern High Atlas Mountains which lie close to the border wth Algeria. 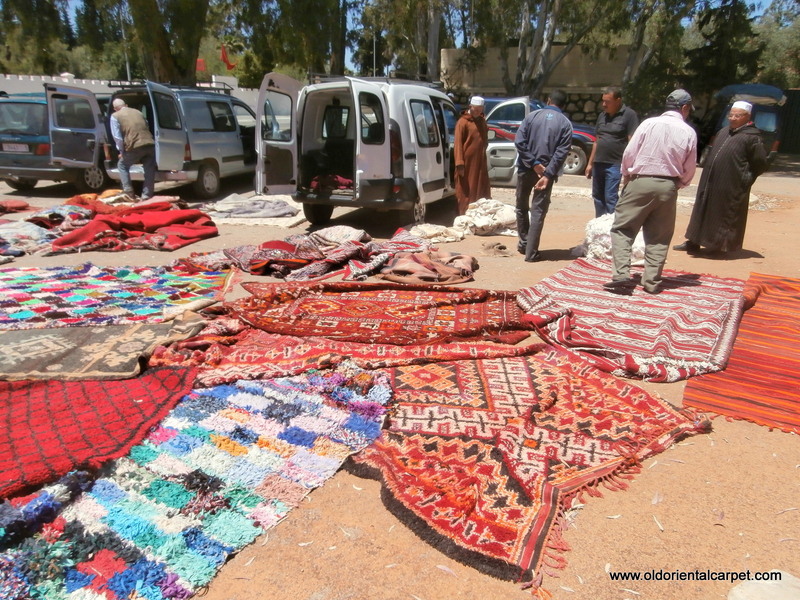 There are at least ten major variations of flat weave techniques used by this Berber tribe which is extraordinary considering the primiive nature of both geography and lifestyle which prevail. Fortunately the weaving of both flatweaves and piled rugs was researched and documented in the book "Ait bou Ichaouen" by the husband and wife team of Alfred and Susanne Saulniers. 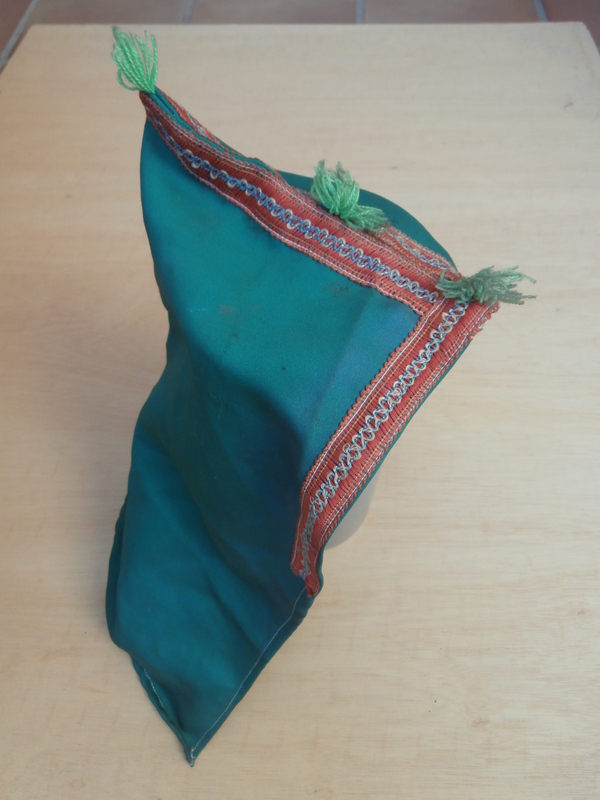 This fine bag was probably one of a pair and given as a dowry gift. The small narrow opening along the top edge is just big enough to allow a hand to put items inside for storage. The design on the front is a lattice of hand tied knots. Reference 2820. Size 13 x 29 inches. Euros 190. BERBER HIGH ATLAS TENT BAG which is the very fine work of the little known Ait bou Ichaouen Berbers in the eastern High Atlas Mountains which lie close to the border wth Algeria. 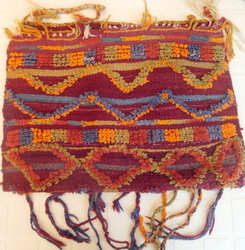 There are at least ten major variations of flat weave techniques used by this Berber tribe which is extraordinary considering the primiive nature of both geography and lifestyle which prevail. Fortunately the weaving of both flatweaves and piled rugs was researched and documented in the book "Ait bou Ichaouen" by the husband and wife team of Alfred and Susanne Saulniers. 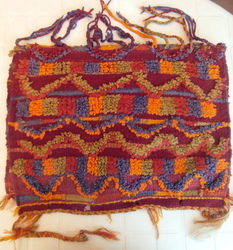 This fine bag was probably one of a pair and given as a dowry gift. The small narrow opening along the top edge is just big enough to allow a hand to put items inside for storage. The design on the front is a lattice of hand tied knots. Reference 2820. Size 13 x 29 inches. REVERSE. 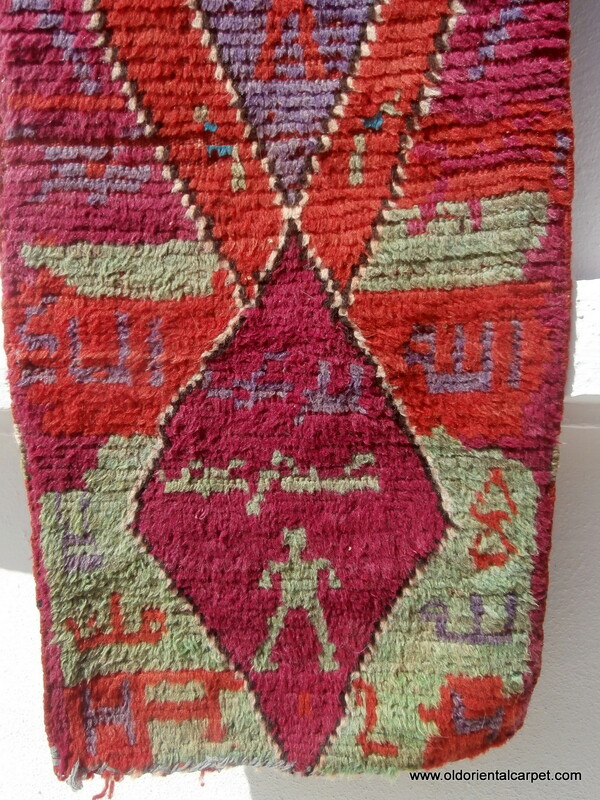 MOROCCAN MIDDLE ATLAS DOUBLE SADDLE BAG from the region of Zemmour. 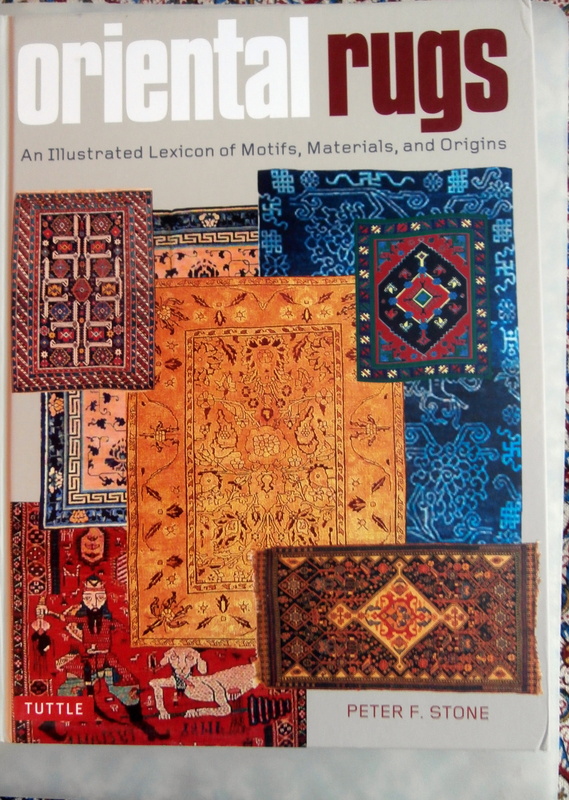 PUBLISHED IN "ORIENTAL RUGS: AN ILLUSTRATED LEXICON OF MOTIFS, MATERIALS AND ORIGINS" by Peter Stone, page 316. The bag itself has a very fine embroidered design on both panels and has been further embellished by extensive use of metal sequins. See `Splendeurs du Maroc` - Musee Royal de l`Afrique Centrale, 1998, page 148. Reference 2012. Size 104 x 37cms, 3ft 5ins x 1ft 3ins, Euros 385. THIS DOUBLE BAG IS PUBLISHED on page 316 of this very important book. 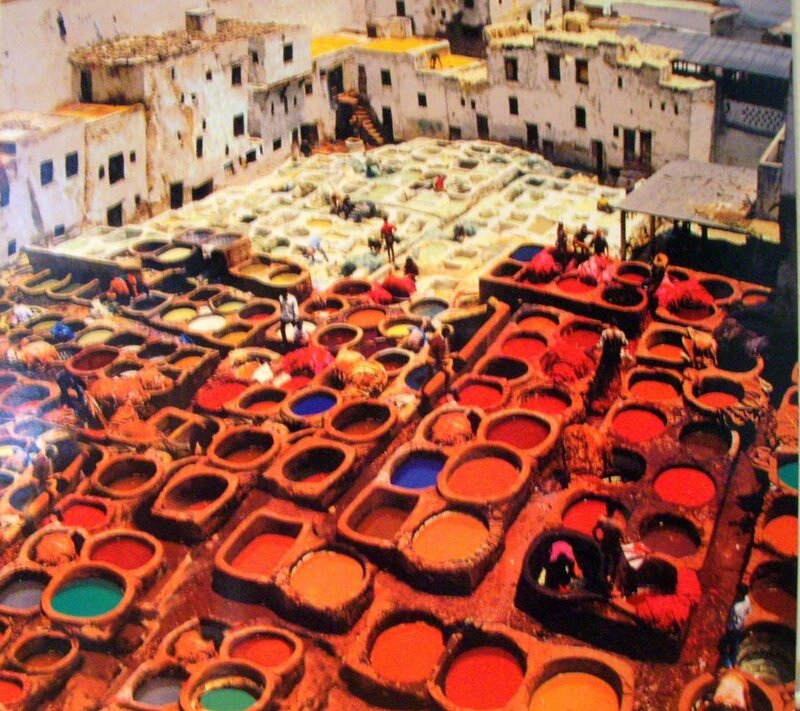 Vats of dye in the city of Fez. This is where I buy wool for my restoration studio. MOROCCAN BERBER MIDDLE ATLAS SADDLE BAG which is of exceptional fineness and was probably woven as a dowry piece. 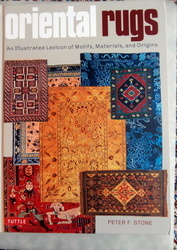 It has a plain, fine kilim background upon which design has been embroidered and many sequins added. There is a similar piece attributed to the early to mid 20th century from the region of Zaine in the Middle Atlas which is colour plate 58 in "Arts and Crafts of Morocco". Reference 2550. Size 84 x 34cms. 2ft.9in. x 1ft.2in. CLOSE UP. MOROCCAN BERBER MIDDLE ATLAS SADDLE BAG which is of exceptional fineness and was probably woven as a dowry piece. 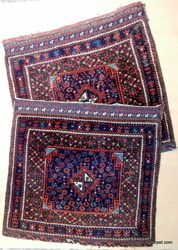 It has a plain, fine kilim background upon which design has been embroidered and many sequins added. There is a similar piece attributed to the early to mid 20th century from the region of Zaine in the Middle Atlas which is colour plate 58 in "Arts and Crafts of Morocco". Reference 2550. Size 84 x 34cms. 2ft.9in. x 1ft.2in. Euros 190. 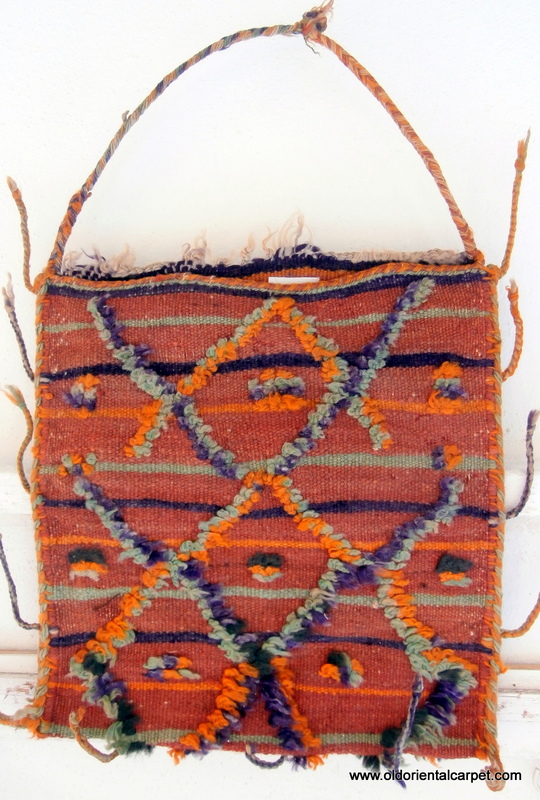 MOROCCAN BERBER HIGH ATLAS BAG FACE, which is an extremely rare example of work from the Berber of Ait bou Ichaouen, probably the Ait Hammou group. 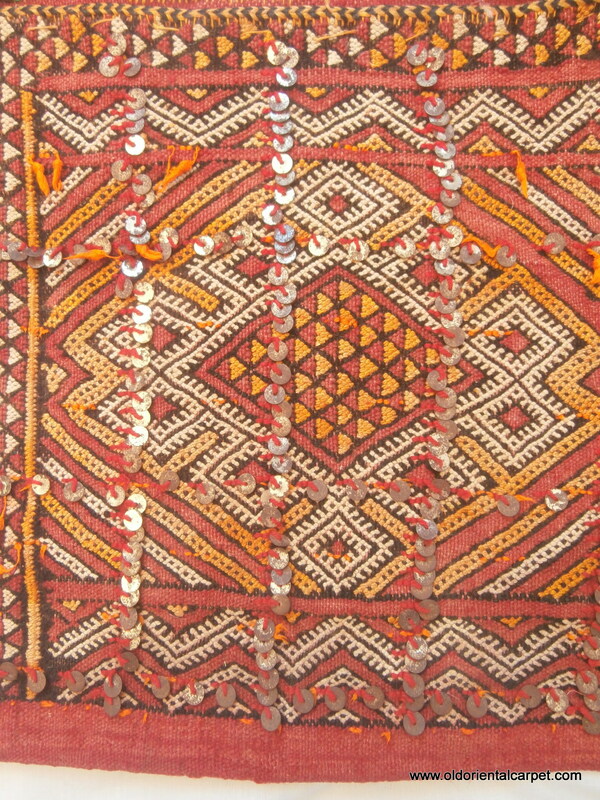 The weaving has significant religious designs and the owner may have been one of the men who appear in the two diamonds, the lower one of which contains the name "Abdullah". There are also the words for "Allah", "The King" and "Our Land". The wording used is in the Amazigh (Berber) language and one very old inhabitant of the village I found it in said it was in the Tifinagh dialect. The letter "H" and number "2" are also shown and these are both used in written Amazigh. Abdullah is well protected by the inclusion of a design representing a dagger to his right. A most fascinating, rare and important piece. Reference 2663. Size 84 x 45 cms., 2ft. 9ins. x 1ft. 6ins. CLOSE UP OF INSCRIPTIONS. 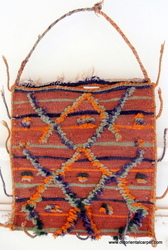 MOROCCAN BERBER HIGH ATLAS BAG FACE, which is an extremely rare example of work from the Berber of Ait bou Ichaouen, probably the Ait Hammou group. 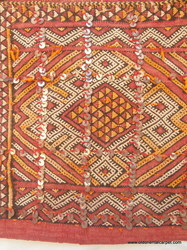 The weaving has significant religious designs and the owner may have been one of the men who appear in the two diamonds, the lower one of which contains the name "Abdullah". There are also the words for "Allah", "The King" and "Our Land". The wording used is in the Amazigh (Berber) language and one very old inhabitant of the village I found it in said it was in the Tifinagh dialect. The letter "H" and number "2" are also shown and these are both used in written Amazigh. Abdullah is well protected by the inclusion of a design representing a dagger to his right. A most fascinating, rare and important piece. Reference 2663. Size 84 x 45 cms., 2ft. 9ins. x 1ft. 6ins. Euros 675. I checked every single one of the bags and trappings brought by this man to the Monday morning market, but could not find anything really great. Monday morning rug market in the Middle Atlas. 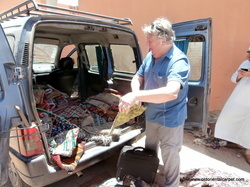 Rugs have been gathered in the villages for the past week and now the negotiations begin. I work here frequently. MOROCCAN BERBER TENT BAG. Known as "Anoual", this type of piled bag acts as a cushion or pillow and is usually part of a dowry. It is an old example in remarkably good condition with all original fastening loops intact. The bag is from the Berbers of Ait bou Ichaouen in the eastern High Atlas close to the border with Algeria. There are entirely different designs on each side. One is extremely rare and depicts a flight of Potez 25 bi-planes used by the French colonial government to bomb the rebellious Ait Hammou Berbers in the early 1930s. The Berbers have long memories. The incident and designs which commemorate it are described in the excellent research book "Ait bou Ichaouen". The second side depicts a large "evil eye" motif which in Berber superstition protects the owner from bad luck. This is an important and rare example of its kind. Reference 2664. Size 42 x 88 cms., or 17 x 35 inches. Euros 188.